Hope you enjoyed yesterday’s review of Bingo Love! If you did not get a chance to read it, click the link at the top right after reading this. Today I’m continuing my full week of graphic novel reviews with a knock-out sci-fi survival book that’s a refreshing addition to the genre. Once again this is one of those books that has been on my list of titles to review for some time; it’s one of the reasons that I took this week to get back to my old ways and crank out a bunch of reviews. And it’s nice to be reading this many graphic novels again. 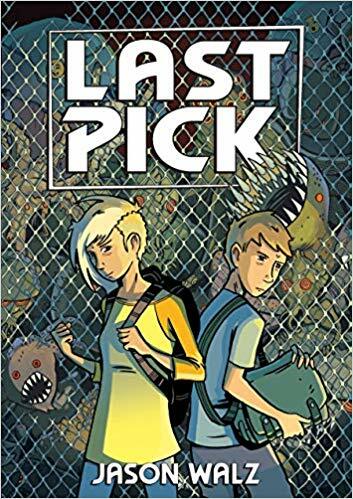 Last Pick is a sci-fi graphic novel set in a world where everyone between the ages of 16 and 65 has been taken away by aliens, and the rest of the too young and too old have been left on the planet, dealing with their new alien rulers. Twins Wyatt and Sam are two of the young ones left to fend for themselves as their parents are scooped up by the aliens for who knows what reasons. As the book begins, we are taken through the lives of these youngsters. Sam, the adventurer, out in the world collecting supplies and helping people get more than they are rationed; and Wyatt, the smart one with notebooks of information and tech projects. These kids are not only surviving but trying to find a way to locate their stolen parents. There are a good number of twists and turns in this 200+ page graphic novel, but more interesting than the story are the nuances that make this book worth a read. The book goes through bouts of interesting narration, uniquely blue-toned flashbacks, and creative art shifts (Wyatt and Sam imagine a mission as an 8-bit video game at one point)…just to name a few. 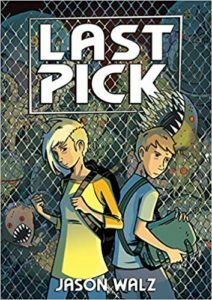 It feels like Walz understands the somewhat saturated market of the sci-fi YA graphic novel, and he creatively works in the genre to bring us a tale that’s fresh and engaging. The 200+ pages help as well. More story means more time for the reader to get hooked into the characters and plot development. I often find myself wanting much more from a 100-140 page graphic novel…they usually feel unfinished for a book one; however, while this book does not tie up a lot of ends, there is more than enough story to make me want to read book two. Which, by the way, will be coming out in October 2019 so get ready! It’s book two in the trilogy. I read a lot in this genre. And few have hooked me like Last Pick has. It’s simple; it doesn’t have the complexity of a Spill Zone or the thickness of a Home Time, but I like that about it. Most in the YA sci-fi/fantasy genres that are simple are too simple, and they fail to engage; not this book. I feel for this protagonist duo, and most readers will too.